As we age, both environmental damage and the slowing down of natural processes, such as the making of elastin and collagen, can make us appear older. When you think about changes to your appearance that make you look old, you probably think of wrinkles, dark spots, and graying hair. These can certainly all give away your age when you want to appear more vibrant. But there are other, subtle signs of age that our brains pick up on that we may never even think to address. One of these signs is the color of your eyes. No, you won't look younger if you have blue eyes instead of brown eyes or vice versa, so don't rush out for some colored contact lenses unless you just want to change your eye color. I'm talking about the color of the sclera, or the whites of your eyes. When we're young and healthy, our scleras are clear and white. But as we age, they can take on a red, yellow, or brown tint, often as a result of environmental damage from UV rays and exposure to wind and dust. You may think that this wouldn't be a big enough difference to affect how people perceive our age, but a study published in Psychology and Aging last year proved otherwise. In this study, the researchers asked people to look at pictures of adult Caucasian females. The researchers manipulated only the colors of the sclera and asked participants to rate the women on their age, health, and attractiveness. The darker, redder, or yellower the sclera, the older, less healthy, and less attractive the participants judged the women in the photos. Fortunately, there are steps you can take to keep your sclera bright and healthy. First, protect them from damage. Wear sunglasses and a wide-brimmed hat to keep the sun out of your eyes. Second, choose foods that are good for your eyes. This includes the strong orange and yellow foods — foods rich in vitamin A, such as (you guessed it) carrots, peaches, papaya, and mangoes; vitamin C (including oranges, grapefruit, and bell peppers); vitamin E (sunflower seeds, peanut butter, and almonds); antioxidants (such as leafy greens — these will also strengthen our eyes and help fight macular degeneration and cataracts); and zinc (including sesame seeds, cashews, shiitake mushrooms, and avocados). If you'd like to go a step further, you can also try Advanced Vision Formula, which contains all the essential nutrients and antioxidants eyes need for clearer, sharper vision. 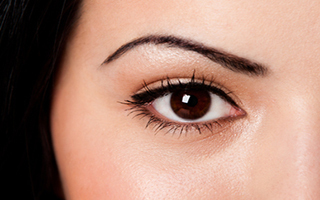 Not only will your eyes look young, they'll perform like they're young too!